Burgers seem to be the in thing at the moment. A few weeks ago a friend dragged me along to a Hugo Boss sample sale in Camden. It had been a bloody long day and the last thing I wanted was to be pushed and shoved by a bunch of mad shoppers paying £40 for a shirt that’s ‘on sale’. The only thing that convinced me was the offer to buy me dinner after. I rocked up at Camden station and after walking 10 minutes in the wrong direction, I finally arrived at the sample sale. Nearly an hour later and now approaching 9.30pm, we finally headed back towards Camden market, passing Inverness Street on the way and decided to try the “Gourmet Burger” joint Haché. Whilst at the time we assumed it was a new addition, turns out according to the website it’s been there since 2004 and was actually also nominated as the best local restaurant. There are also a couple of other branches. Neither of us had heard about Haché so it was a pleasant surprise to come across the modern restaurant with outside al fresco style seating as well as internal seating. With the doors left wide open, this place was perfect for what was a warm summer’s day. Upon entering the restaurant, we were quickly seated next to the counter. The restaurant itself was fairly small with a front section which was quite bright and airy and then down a few steps into a back section which was just as narrow but a lot more packed. We quickly went to order our drinks. We both decided on fresh orange juices and were perfectly satisfied when they arrived. At the same time, we ordered our food. The choice of burgers is vast with everything from beef, lamb, chicken, duck and pork to tuna steak and cod and smoked mackerel. The way Haché has differentiated themselves from other burger places is the accompaniments they serve with the burgers. The most interesting options on the menu were the “Steak Louisiana” which was described as a Scotch Beef Steak Burger topped with American Crunchy Peanut Butter and melted mature cheddar cheese. Unfortunately this was a little too experimental even for me. All burgers as is now fairly normal are served on either a ciabatta or brioche bun or on a low calorie salad.
. 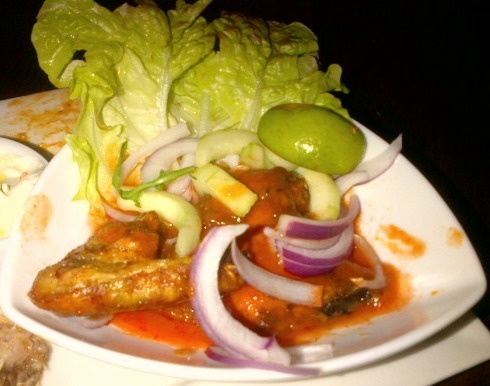 The wings were of a decent size and were cooked will, topped with a mildly spiced sauce. We made our way through these quite easily and obviously forget to take a picture until we’d tucked in. Although I can’t really say these were out of the ordinary, they were nice enough. Having demolished the chicken wings, our main arrived. At this point I must comment that the overall presentation of the burgers really wasn’t anything to shout about. It was sloppy and a little amateur. 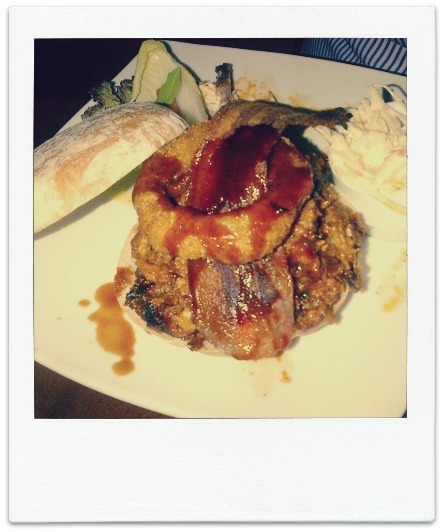 The pulled pork burger which was described in the menu as slow roasted barbecued pork with crispy pancetta topped with an onion ring and coleslaw was quite literally as described. The pork was most definitely slow roasted, it was flakey and soft enough to melt in your mouth. Although from the bite that I tried, my comment would be that it was maybe slightly over sauced as the sauce was really all you could taste. My friend was more than happy with the choice though. The one thing we both agreed on was that the Haché coleslaw in fact tasted like Tesco/Sainsbury’s coleslaw and wasn’t anything special at all. In fact to name it “Haché Coleslaw” is only really an insult to their chef’s abilities. I ordered the Lamb Moroccan on salad. The menu did a good job of selling it to me as ‘premium Hachéd English Shoulder of lamb, with exotic mix of spring onions, coriander and smoked paprika, served with a spicy harissa dip’. 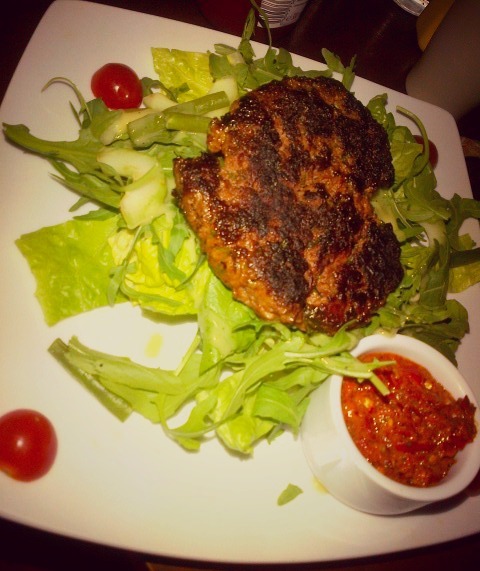 What actually arrived was a slightly burnt lamb patty which was well seasoned but lacked the depth of flavour that it was sold as having on a bed of lettuce with a bit of harrissa sauce to accompany it. Being sometimes over critical, my friend decided to have a taste and said that which it was slightly charred, but overall it was pretty well cooked. I feel the burger was lacking something, maybe a bit of halloumi to add texture, but I guess if I’d had it in a bun, it would have provided enough texture. 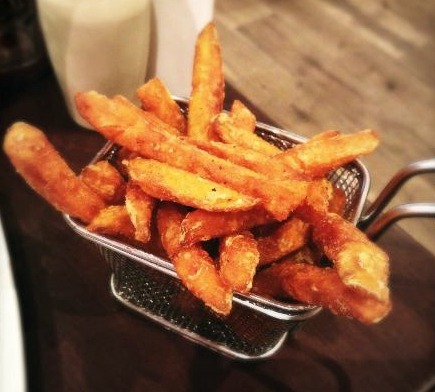 The only side we tried was the sweet potato frites which were great. I have a major aversion to sweet potato and these were perfectly crispy and seasoned so that they were neither sickeningly sweet nor awfully salted. We decided against dessert as we were pretty full from food, but overall the food was reasonable and not bad. With such a large menu, it’s always hard to know what to go for as a customer and as a chef it’s hard to get everything right. Given that the restaurant itself if quite small, I think if they were to reduce their menu size, they’d most definitely be able to get everything spot on, rather than some bit great and other bits not so great. With so much competition out there in terms of burgers, it’s even more important to get it right, will I go back? Not in a hurry and certainly not especially to visit Haché but maybe if I was in the area with a lack of options.